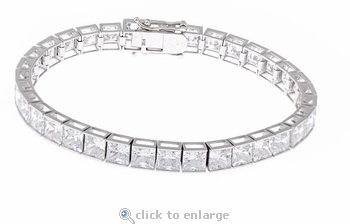 Our Channel Set .75 Carat Each Princess Cut Cubic Zirconia Tennis Bracelet is an absolute beauty! This bracelet is a work of art. It features, what seems to be an endless and seamless row of .75 carat each 5mm princess cut cubic zirconia square stones set with such precision. Our Russian formula cubic zirconia is hand cut and hand polished to exact diamond specifications for a finished product that will surpass your expectations. 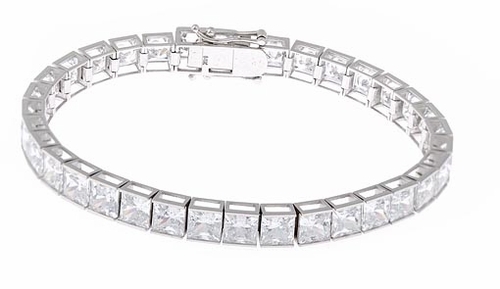 This bracelet is available in 14k white gold or 14k yellow gold and in your choice of a 7 inch length or upgrade to an 8 inch length, please see the pull down menu for options. For further assistance, please contact us directly at 1-866-942-6663 or visit us via live chat and speak with a knowledgeable representative.